Aditya Sarwate was clinical with both bat and ball in the final of the Ranji Trophy. The 85th season of the Ranji Trophy was concluded today where Vidarbha was crowned champions for the second time in succession. Vidarbha successfully defended their title defeating spirited Saurashtra. However, this season witnessed a unique kind of record among the top five wicket-takers, i.e., they all are "slow left-arm orthodox". Vidharba set a 206 runs target for Saurashtra in the 2nd innings of the Ranji Trophy final, but Aditya Sarwate's six-for helped fold the opposition 78 runs short of the target, and Vidarbha clinched the back-to-back title. Surprisingly, Aditya Sarwate - the leading wicket-taker for Vidarbha, Dharmendrasinh Jadeja for Saurashtra, Ashutosh Aman for Bihar, Gurinder Singh for Meghalaya and Saurabh Kumar for Uttar Pradesh are all slow left-arm bowlers, and they sit at the top of the highest wicket-takers chart of the Ranji Trophy 2018-19. Cricket has witnessed a lot of advancement in the game since its inception, and in the recent trends, most captains prefer wrist spin over the finger spin especially in the shorter format. Still, this mildly fading art is yielding some magnificent results in Indian domestic cricket. The numbers don't lie. The top wicket-takers of the season are all finger spinners and coincidently, slow left-arm spinners. This unique record strongly suggests that the finger spin is still a vital tool in any bowling set up. 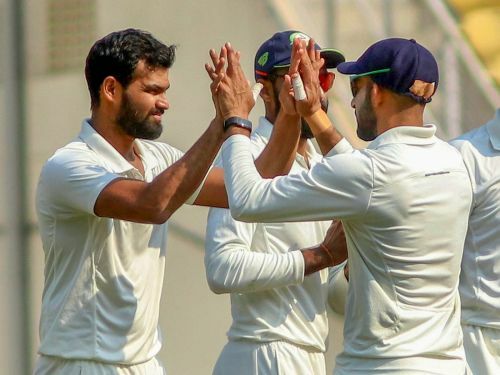 With the conclusion of the Ranji Trophy, Aditya Sarwate and Dharmendrasinh Jadeja are sweeping the accolades from the entire cricket fraternity, and they would definitely like to repeat their sublime form in the upcoming Irani and Syed Mushtaq Ali Trophy ahead of the IPL 2019.